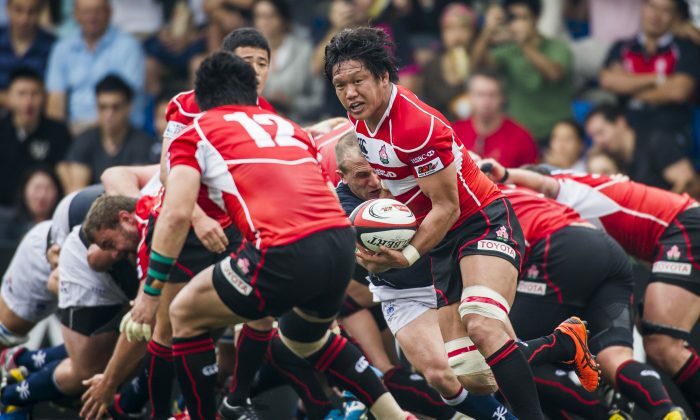 Hong Kong’s forwards played “superbly”, but their backs did not, in their final match in the Asia Five Nations against South Korea on the weekend. South Korea consolidated second place in the series behind Japan by scorching Hong Kong 43-22, at home in Ansan, South Korea, on Saturday May 18. Meanwhile, Philippines beat United Arab Emirates (UAE) 24-8 at home in Manila to retain a place in the tournament. UAE, the bottom placed team, drop out of next year’s tournament in favour of Sri Lanka. Japan, who didn’t play in the final week of the series, had won the series the previous week when they completed a clean sweep in Asia’s top rugby international series. South Korea surged to 12 points early in the match with tries by Oh Youn Hyung and Kim Gwong Min, but Hong Kong fought back with some strong forward play forcing two penalties both taken by Niall Rowark to bring the score to 12-6 at half time. Korea pushed ahead further after three minutes of the second half from a good run by their number seven, Park Soon Chai, who laid the ball off to winger Kim Gwong Min to score under the posts, pushing the score to 19-6. Strong play by Hong Kong’s forwards were successful in pushing play close to the Korean goal line, but the move broke down when an across the field kick missed its target. A penalty to Hong Kong pushed play back up to the Korean line, but the line-out was won by Korea and a full length of the field run started by winger Bin Jegal, with successive passes, for Oh to score near the corner flag. Although the kick was missed, Korea were now on 24-6 after 11 minutes of second half play. Hong Kong pulled three points back with another well taken penalty to make it 24-9 on 54 minutes. A good period of Hong Kong forwards play again pushed them within five metres of the Korean line. A good across the park movement put a delighted Jonny Reese in at the corner, but the conversion was missed, making it 24-14. A further penalty against the yellow carded Korean No. 1, Kim Kwang Sik, pushed the score to 24-17 and Hong Kong looked like they might push on for the comeback win. A quick break and strong run by centre Kwon Jung Hyuk from within the Korean half, passed the ball to fly half Oh, who went over for his hat-trick. This was converted to make the score 31-17. Although a second Korean player—No. 22 Jang Song Min—was yellow carded on 68 minutes and Hong Kong took advantage to push once again to the Korean line, they could not force the try. Korea looked dangerous again, running the ball from a 5-metre scrum at their end, but the move broke down with a handling error. Hong Kong tried some short quick passes from the resulting scrum and were making progress, when one pass went straight into the hands of centre Kim Nam Uk who made an 80-metre dash for the try line. This was converted to make the score 38-17 with only four minutes left on the clock. Korean reserve, Kim Jeong Min scored two minutes later and the match was all but over at 43-17. In the dying minutes, a good 20-phase attack by Hong Kong ended with a consolation try for skipper Tom McColl to make the final score 43-22. Leigh Jones, Hong Kong’s head coach, explained his team’s effort. “We worked hard to stay in touch, but they are a good side,” said Jones after the match, according to an A5N media release. “Our forwards played superbly, but unfortunately the same cannot be said of our backs. “They [Korea] have a lot of players playing professionally in the Japan Top League and we couldn’t afford to give them an easy lead, which they had on a number of occasions during the match,” Jones said.